PCE-GM 50 gloss meter is a highly accurate digital gloss meter. 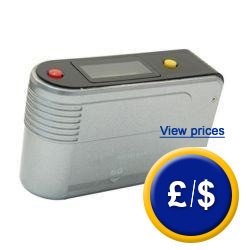 This gloss meter is easy to use, compact and solidly built. Colour and gloss are very important factors to determine surface characteristics. 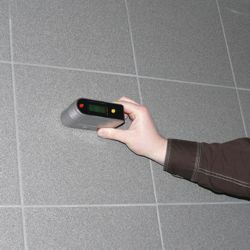 This gloss meter can take measurements on the spot when needed, in laboratories, or in receiving departments. The gloss meter PCE-GM 50 is durable and easy to use. Gloss is determined by measuring the reflection of light on a particular surface. This measurement takes into consideration the intensity of light reflected from a specific point onto a specific surface. According to this, the surface gloss reading of glass with the previously calculated coefficient of 1567 must indicate the value relative to 100. A plate of black glass is used as the reference surface for calibration with a value of 90. This unit has a measuring geometry of 60° and can be used on flat surfaces. 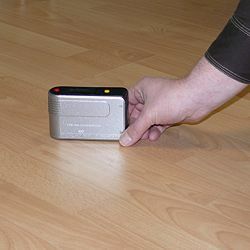 The PCE-GM 50 glossmeter measuring a varnished surface. Here you can see a reading taken by PCE-GM 50 glossmeter. Operating conditions 0 to 40ºC/85% r.h.